The Common Process Framework is a set of tools, methods and representations for integrating AI planning technology and plan representations into organizations for the primary purpose of synthesizing and managing organizational processes. It meshes and extends past and present University of Edinburgh planning research and infuses it with new work in ontological engineering, knowledge sharing, requirements engineering and design rationale. 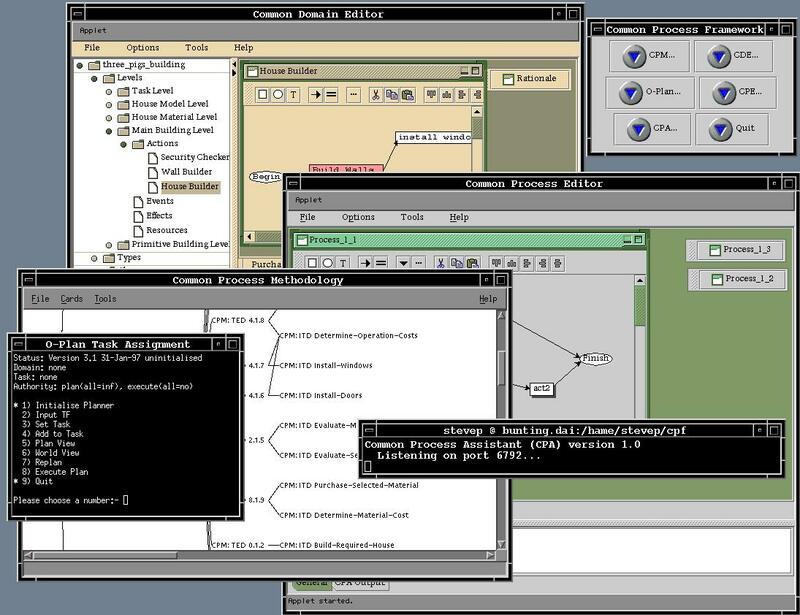 The CPF provides a simple java-based control panel for launching the tools in the framework. For more information on this see the documentation links below. The CPM provides methods and representations for analysing a process domain using a viewpoint-based, requirements engineering approach. This aids in producing an initial specification of the domain which can be translated to the Common Process Language (CPL). The methodology is supported by the CPM Toolset, a Hardy-based tool for creating CPM specifications and running rule-based (CLIPS) checks. The CDE is a java-based domain editor for constructing an operational specification of a planning domain. It can import the initial specification produced by the CPM and CPM toolset and can be used to translate to the language required by the O-Plan planning system (Task Formalism). A new process may be automatically synthesized by communicating with the AI planning system, O-Plan. As part of the framework, a new module was written for O-Plan to enrich the plan output format so that it also includes information about plan resources, effects and dependencies. The CPE provides java-based process visualization and editing capabilities of newly synthesized processes and process knowledge. CPE utilizes a translator which converts O-Plan plan output format into the Common Process Language(CPL). The CPA is a prolog-based tool for analysing process knowledge. CPE and CDE communicate with the tool via a defined socket-based protocol. Currently, it can evaluate temporal relationships by mapping the timepoint-based representation into an interval logic and reasoning about legal transitive interval relationships.